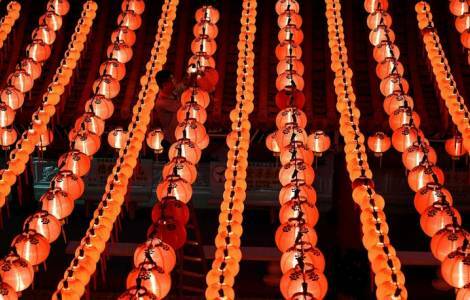 Archbishop Dal Toso: "Without testimony, the Gospel would be mute"
Taipei (Agenzia Fides) - China, like other countries of the Far East, follows the lunar calendar, starting this year from 5 February. "The feast begins with the eve of the new year - says Fr. Giuseppe Dido, a Camillian missionary in Taiwan to Fides - when a large quantity of food is placed before the altar of the ancestors, so they may 'eat first'. Then, in the evening, with the food removed from the altar of the ancestors, the big dinner of the reunited family begins. All members return home, even those who work very far. At midnight, after the arrival of the new year, or early in the morning, children receive red envelopes from their parents, as a sign of abundance and happiness. A big red writing, 'Spring', announces the arrival of the new season, which begins with the new year". The missionary points out that the celebrations revolve around two very important concepts and deeply rooted in Chinese culture, the first of which is the veneration for the ancestors, to whom incense is offered. The Catholic Church also participates in this ceremony, which takes place in a solemn form after the Mass of the first day of the Chinese New Year and other important festivities during the year. The second aspect is the great value given to the family union. On the eve of the new year, before starting dinner, the Chinese venerate their deities, in the early morning of the first day of the new year they venerate their ancestors and then begin to exchange good wishes for a happy new year.